Diyas spread all over the streets. The shopping spree has reached its extreme. Being a south India, let me start of with celebrations in South India. Narakasura ruled the kingdom called Pradyoshapuram. Puranas say that Naraka, son of Bhudevi, acquired immense power from blessings given by Lord Brahma after a severe penance. Under his rule, the villagers suffered a lot of hardship as the demon tortured the people. Unable to bear the tyranny of the demon, the celestial beings pleaded with Lord Krishna to save them from his torture. But Naraka had a boon that he would face death only by the hands of his mother Bhudevi. So, Krishna asks his wife Sathyabhama, the reincarnation of Bhudevi, to be his charioteer in the battle with Naraka. When Krishna fell unconscious after being hit by an arrow of Naraka, Sathyabhama takes the bow and aims the arrow at Naraka, killing him instantly. Later Lord Krishna reminds her of the boon she had sought as Bhudevi. The Narakasura Vadh by Sathyabhama could also be taken to interpret that parents should not hesitate to punish their children when they step in to the wrong path. The message of Naraka Chaturdashi Parva is that the good of the society should always prevail over one's own personal bonds. It is interesting to note that Bhudevi, mother of the slain demon Naraka, declared that his death should not be a day of mourning but an occasion to celebrate and rejoice. It is said Lord Krishna had an oil bath to rid himself off the blood spattered on his body when Naraka was killed. Which then became a practice to take oil bath on this day. Boil the milk in a non stick pan. Simmer the stove and allow it to condense to half its quantity. Once done, add sugar and mix till it gets dissolved. Take two tsps of hot milk and soak few saffron strands in it for ten mins. Add the soaked saffron strands along with the milk and mix it. Finally sprinkle some cardamom powder. Ras is ready. Refrigerate it until use. Boil milk in a vessel and once it starts to raise pour in the lemon extract and switch off the stove. Mix with a ladle until it curdles. Drop in ice cubes into the vessel immediately. Then drain it in a thin muslin cloth or handkerchief. Hold it covered with cloth in the running water. This is to remove the lemon flavor from the prepared paneer. Hang the cloth and allow it to drain for half an hour. Now press and remove the excess water and transfer it to a bowl. Kneed the soft paneer into a dough. Roll into small balls and press them a lit flat. Take the water and sugar in the pressure pan and mix till it dissolves. Once the water starts boiling drop in the rolled malai balls and pressure cook with weight on top for a whistle. Switch off the stove and keep the pressure cooker under running water to cool it soon. Open immediately and transfer the cooked balls along with the sugar water to a different bowl. Leave it alone for 4 to 5 hours. Later remove the the balls from the jeera and press them gently to remove excess jeera and drop them into the prepared ras. Serve it cold and top it with chopped almonds and pista. love it nithya. beautifully presented. love those cute bowls. awesome rasmalai! wonderful presentation nithya...very tempting ras malai!! !perfect for the diwali...Advance Happy diwali dear! wow..gorgeous presentation n yummy rasmalai!! Advance happy Diwali to you. rasmalais look simply mouthwatering . So nicely decorated as well. 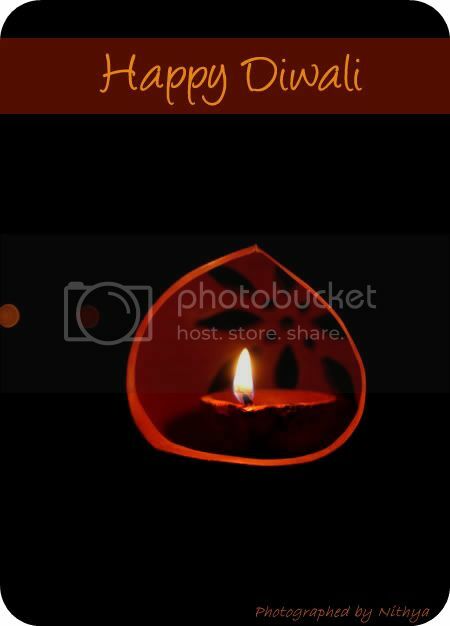 Happy Happy Diwali. Ras malai seems to be easy and your presentation is fantastic!! Rasmalai looks very tempting! Pretty clicks as usual! Looking forward for more in this series! Something completely new for me..beautifully presented. great pics & superb presentation Nithya. super nithya :) looks very delicious :b the cups in which you have served.. are very adorable.. Photos are very nice.. so, the Diwali celebrations have started.. Wonderfully done Nithya! Happy Diwali to all of you too. What a great way to start off the sweet season - dhamaka indeed! 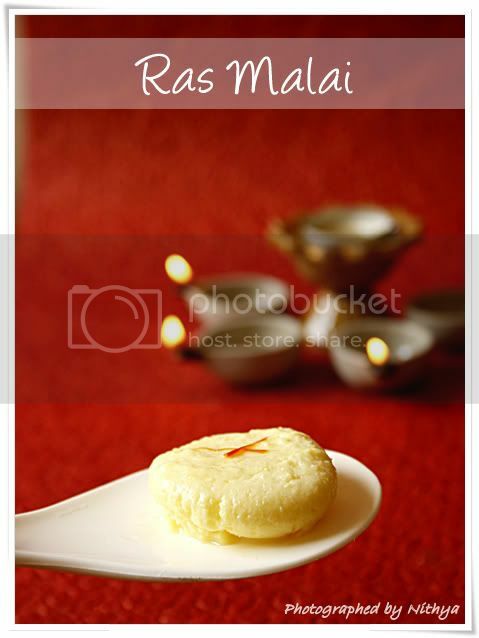 Ras malai looks tempting delicious. Nice presentation. 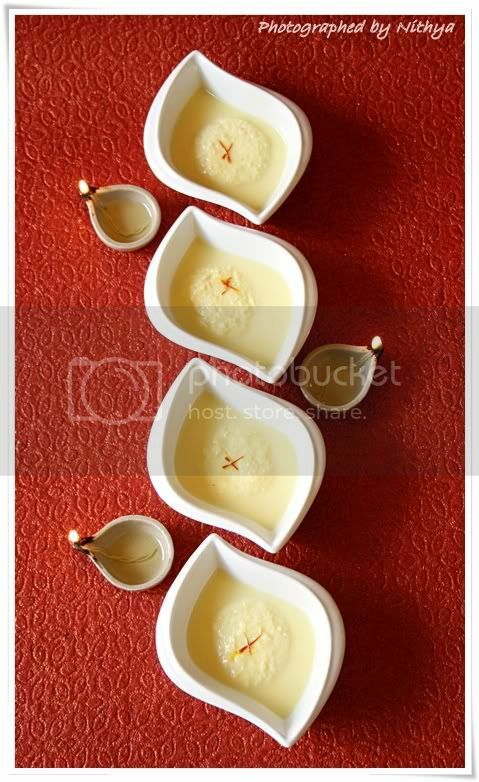 Wow wat a beautiful and irresistible rasmalai, Happy Diwali in advance Nithya..
Thats looking so beautiful. 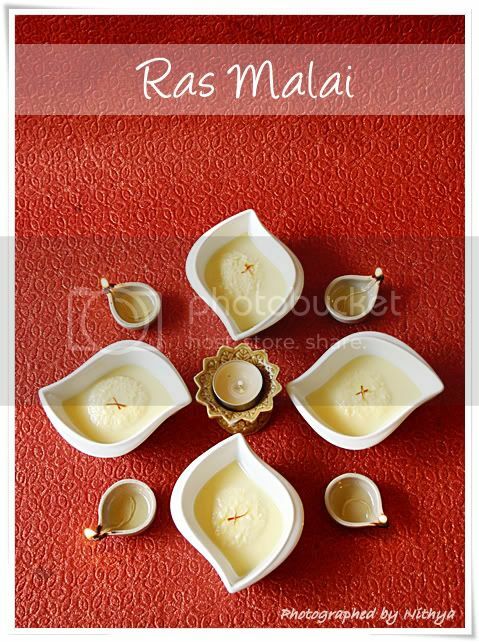 I love rasmalai, and looking at these pics am just salivating :). Mouthwatering recipe. Asesome presentation, love the bowls. Festive greetings, apt sweet for this lovely festival. Have loads of fun, take care.